You have heard of Youtube no doubt. I’m sure that you have watched many videos either on Youtube itself or videos that are placed on websites that are from Youtube. Did you know that 11 million unique active viewers are watching Youtube videos every month in Australia! That’s almost half the population! The other great thing about Youtube is Google owns it. Which means when you are using Youtube for your business video marketing strategies it can not only help you stand out from the crowd, but it can also help you with Search Engine Optimisation as well. This article is about how to search engine optimise your youtube video, so lets get right to it. So many times I have come across videos that are getting lots and lots of views, but the video publisher has missed out on some very important ingredients which can help with getting people to take the next step, which is either to send the viewer to a website and add important information into the title of the video. Below is a screenshot of a video on Youtube that has been setup correctly. You will see the two numbers that are relevant and I will explain what they mean. The title is very important. This video has been optimised for the keywords “horror novels”. 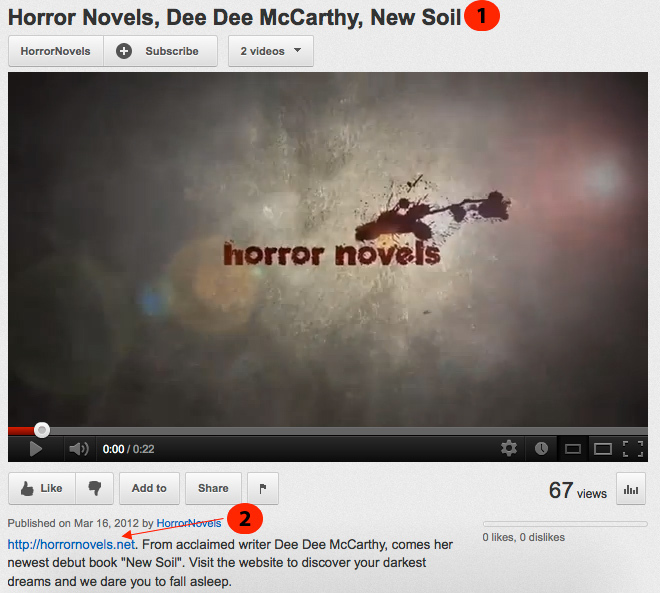 The website is also called “horrornovels.net”. It is important to put the main keywords that the video is about in the title. You can use the Google Keyword Tool to research what the best keywords are! You will notice that the very first thing in the description is the website address. Use the format “https://yourwebite.com” to make it as a clickable link. It’s amazing to see so many videos that have gone viral and the publisher has not got a website address as the very first thing. The reason why we put the link as the first thing in the description is because that if the link is any lower then it could be under the “see more” tab as there is a limit to how much you can have in the first section of the description. If your website is any lower than the first paragraph, then it will not be seen unless the viewer chooses to read more. The other reason why we put the link back to our website is because of the valuable backlink. Google will see that you are actively using it’s tools and will reward you with a better ranking in the popular search engine. If you would like a video marketing strategy plan, give Paul a call on 0405 614 155 or contact us.